Shabbat is the best day of the week! We have worked hard for six days, and then it is time to rest. It’s time to set aside the cares of the world and spend time with YHVH and our families. But how should we spend the day? 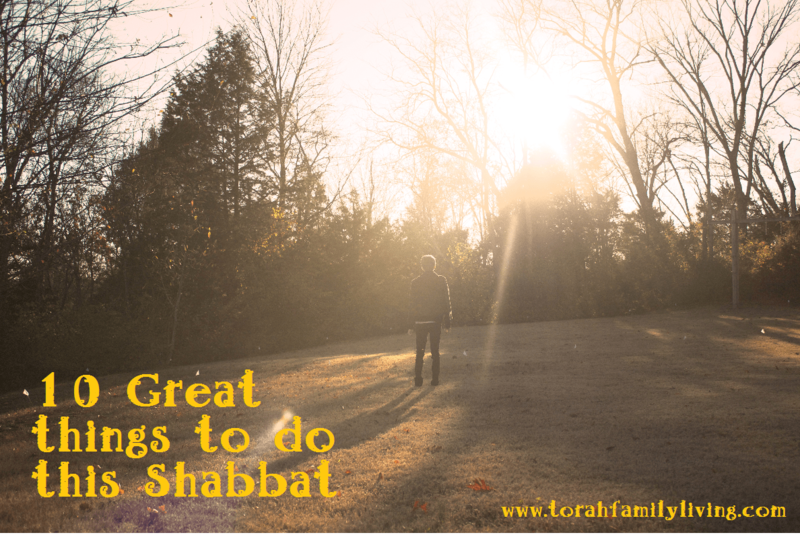 Here are ten great ideas to have a wonderful time this Shabbat. They are not necessarily in order of importance. Rest is a very important part of Shabbat, but one we often overlook. Our bodies are not designed to go full force ad infinitum. They need to rejuvenate every night, and they need to cease from work every week. Make sure that your Shabbat includes time to just put your feet up, or even take a nap, if that’s the kind of week you’ve had. Your body and your mind will thank you. It’s the end of January as I write this post, and the temp outside is probably 27 degrees. I probably won’t be taking a nature walk this week. However, when the weather permits, I find it so helpful to just go outside with my kids and take a nice stroll, or even sit on a lawn chair under a shady tree. We spend so much of our lives plugged in and surrounded by the humming of our electronics. It feels good to feel the air on our face and hear birds in the trees. It just does a body good. If you can, try to get outside for a bit this Shabbat. Shabbat is nothing more than a day off if we simply spend it pursuing whatever comes in our heads without a thought for YHVH and His Word. This should be a priority. If you spend the whole day at home, set aside a specific time each week for reading Scripture together. We study the Bible some on Friday night, and read the Torah portion together on Shabbat afternoon, right after lunch. The grownups usually study a bit more after we read the Torah portion with the kids. Writing Scripture can also be a wonderful activity for Shabbat. We enjoy copying Scripture in a decorative way on Shabbat morning. We make signs to hang on our door, or do Scripture coloring pages together. We spent many years alone every Shabbat. With an online community of believers and teaching videos, this can work when needed. But if you have a local group of believers that you can meet with on Shabbat, be sure to take advantage of the opportunity. Doug and I spend some Shabbats at home, and some or all of us head out to meet with other believers when we can, too. Fellowshipping with other believers is an important part of learning to be united as Yeshua instructed us. So, as often as you are able, get out and spend Shabbat with other believers! Shabbat is a weekly feast day! Celebrate it! We like to pull out the special platters we received for wedding presents and fill them up with crackers and cheese, fruit, nuts, cream cheese, etc. We like to bake something special for breakfast or a snack. Friday night dinner is our favorite meal of the week, burritos! What special treat would you and your family enjoy this Shabbat? The weekly Torah portion is one of those really great things, like sliced bread. People all around the world are studying the same Scriptures each week. It’s a way for all of us to feel just a bit closer together. I’ve heard that the rabbis say that it takes 70 years to get a decent handle on the Torah. Going through the Torah portions every year helps us get there. Aside from reading the portion together, there are lots of teachings on the Torah portions available online. You can even get a free printable list of the Torah portions at the bottom of this post. Shabbat is such an awesome day to spend time with your family! Play a game with your kids. Snuggle and read books together. Take a walk together. Take the time to really listen to your kids and your spouse. There’s no laundry to do, no bills to pay, no tasks demanding your attention. So, give your attention to the most important people in your life. While Shabbat is a wonderful day of celebration and rest, it is also a day to draw closer to our Creator. As a mom, my days get very busy. But on Shabbat, I have plenty of time to spend with YHVH. He delights in spending time with us as well. Think of Shabbat as a divine weekly appointment. Make sure you take time to talk to Him on Shabbat. Also, make sure you spend some time in serious repentance. While we should confess our sins daily, a weekly soul cleaning is a very essential tool as we seek to draw ever closer to our Creator. Whether you sing and make music yourself, or simply enjoy listening to music, include singing and even dancing in your Shabbat this week. We have Shabbat dinner music every Friday night to set the mood for Shabbat. There is an immense amount of music available to listen to online. You can even find Youtube videos with Messianic dances for you to learn. What a wonderful way to praise our Creator! Remember that Shabbat is like seven and a half weeks of vacation every year. Enjoy the day! Use your prep day wisely to fix food ahead and tidy up the house. Then, truly rest and relax on your Shabbat, rather than worrying about what needs to be done, or flitting around looking for work to do. If you are new to keeping Shabbat, this will probably feel awkward at first. It takes practice to just be for a day, rather than doing. So, give yourself some time to learn to just relax. Shabbat is a wonderful gift and it is well worth the effort to learn to truly enter into this rest. Great list ❤️However writing on shabbat is FORBIDDEN. It’s 1 of the 39 restrictions that we can not do on shabbat.